Even after making at least 3 quilts from my stash of flannel leftover from garments, I still had MORE. Anyone know of a flannel contraceptive? 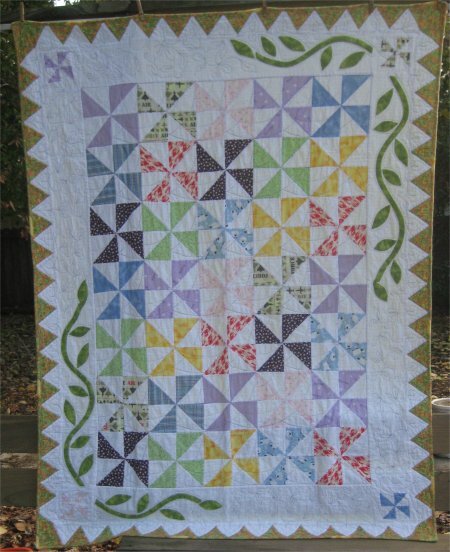 The August 2008 issue of McCall's Quilting featured a really nice scrappy quilt called "Summer at Mom's". Their's was done in cottons, while mine is another cozy flannel memory quilt. I exchanged the half-square triangle sawtooth border shown on the pattern for a freezer paper-pieced dogtooth border but otherwise followed the pattern more or less exactly (my vines & leaves weren't precisely the same either) and am very pleased with the resultant 58" x 76" oversized throw. Generally speaking, I like the look of dogtooth borders versus sawtooth borders. This was a very easy quilt to construct and I didn't run into any problems or had any unexpected Adventures. It all came together so quickly and nicely that I was almost surprised when I realized it was done. I used a bias band for the vines and hand appliqued both the vines and leaves in diagonally opposite corners. Because I had it on hand, I used fleece for backing ... no batting at all. 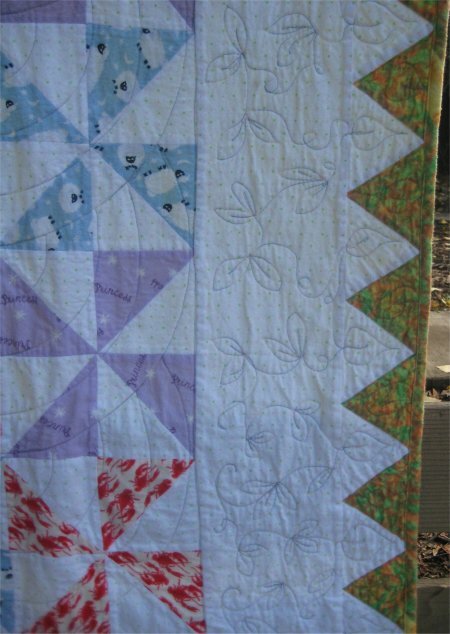 I used this quilt as another practice piece for longarm quilting with Lizzie. 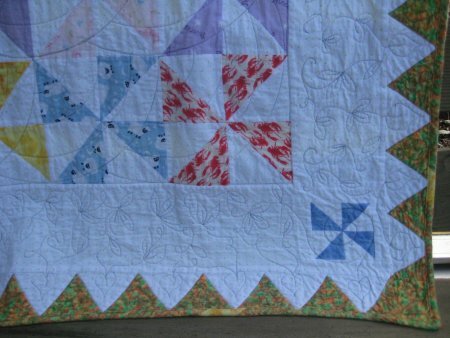 At some point, I really needed to go beyond pantographs on charity baby quilts and work on something that was a bigger size. I also wanted to experiment with different quilting motifs on the same quilt top. I have a plastics fabricator store locally (TAPS Plastics) and one thing they regularly stock are acrylic circles of many different diameters. Because the pinwheel blocks were large (12" square), I wanted a large Baptist Fan design. So I bought 4 circles of the appropriate diameters to give me 4 circular rows. I'm not sure how "professional" Baptist Fan templates work but this home-made version worked out well enough for me; it might have taken me longer to swap out my circle templates but it sure didn't cost me an arm and a leg! I remembered that I had a quilt (that had been longarm quilted by a local quilter) that had some fantastic leaf/vine meandering. I hauled out that quilt and did my own version of a vine meander in the outer border. More leaf/vine meandering was placed in the center of each dogtooth triangle. Then onto the applique part of the quilt. Ugh. I wanted to do outline quilting. What I got was lines that looked like a sleep-deprived 3 year old drew them. Ugh. How on earth do you do nice looking outlines? Or echo quilting for that matter??? (AH. I think I discovered an answer ... a gadget called the Line Tamer. I shall have to look into this a bit more.) Cuz without some real assistance, I can be assured that I just don't have the fine motor control necessary to move Lizzie where she needs to go for precision quilting.